Joovv Red Light Therapy - Is Red Light Therapy a Bright Idea? This is my personal review on Joovv Red Light Therapy, visit the Joovv Website here for more info. So what’s all this talk about red light therapy? How can a red light or near infra-red light at just the right wavelength make you look and feel younger? 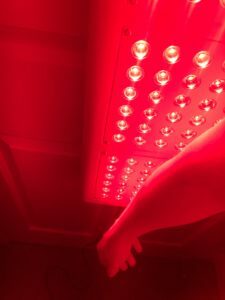 Red light therapy has many anti-aging and health benefits since it increases collagen production, circulation, and even super charges ATP (cellular energy) upwards of 200% to repair damaged cells. The Joovv Red Light isn’t just any red light. It’s a full body sized LED red light that you can place anywhere in your home to treat your entire body! Sounds crazy, right? The Joovv Red Light is FDA Approved. Well, I got one a couple months ago and hung it on the back of my office door, and it’s awesome! I’m going to give you all the details and tell you about my personal experience. Is it like a tanning bed? 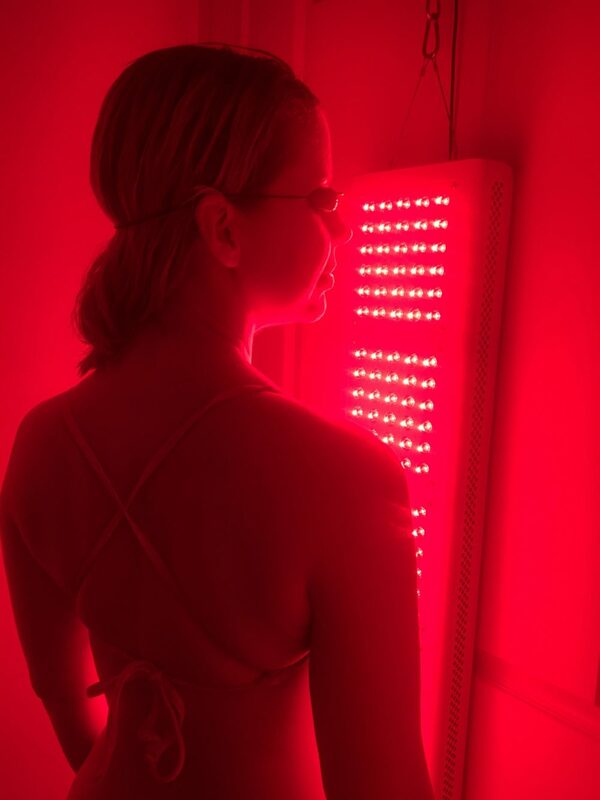 No, red light therapy does NOT emit harmful UVA or UVB rays. You don’t get a tan from using it! It’s a completely different (very safe), therapeutic frequency. Even children and pets can benefit from red light therapy! Is it hot? No, it feels amazing, like a perfect 75 degree sunny day. Did NASA originate red light therapy? Yes, the benefits of red light therapy were first researched and demonstrated by NASA back in 1993 as a way to limit muscle and bone loss while in space. Click Here to watch a short video on how the Joovv Red Light actually works! What is the Joovv Red Light and Who Makes It? 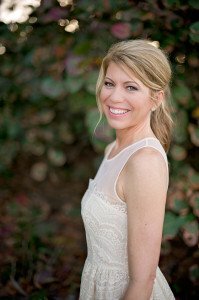 The Joovv Red Light was founded in 2014 by a woman who not long before, had her first experience with red light therapy at her local salon. 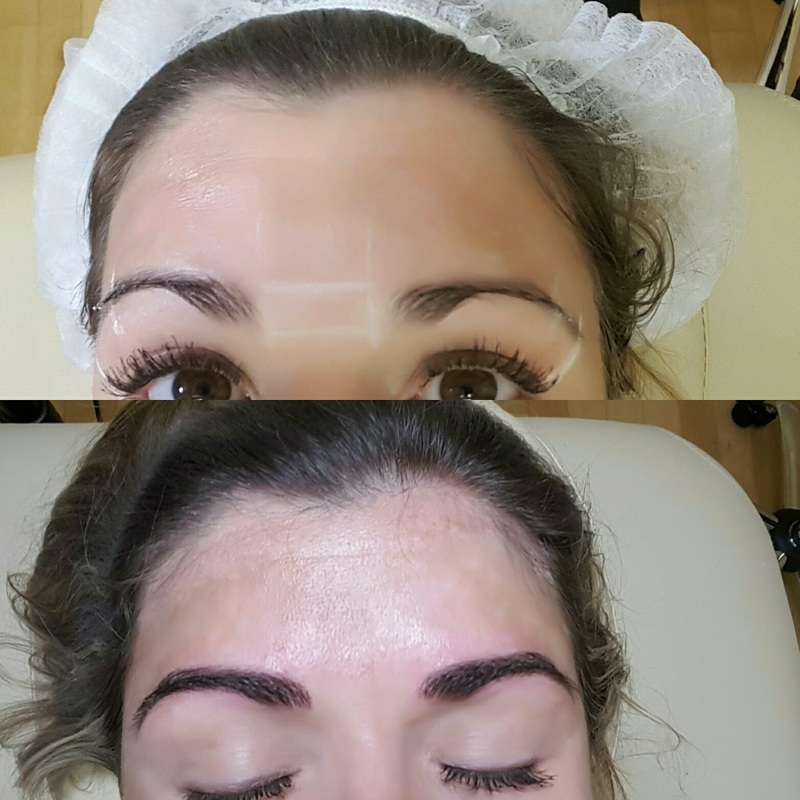 Within weeks, this therapy started to reduce things like scarring back from her childhood, and skin care issues like eczema and stretch marks. The problem was, she could only find small, overpriced versions to use at home. 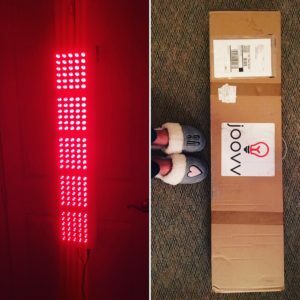 Being married to an engineer and seeing the effects of this treatment, she and her husband decided to make a bigger, better version -The Joovv Red Light! 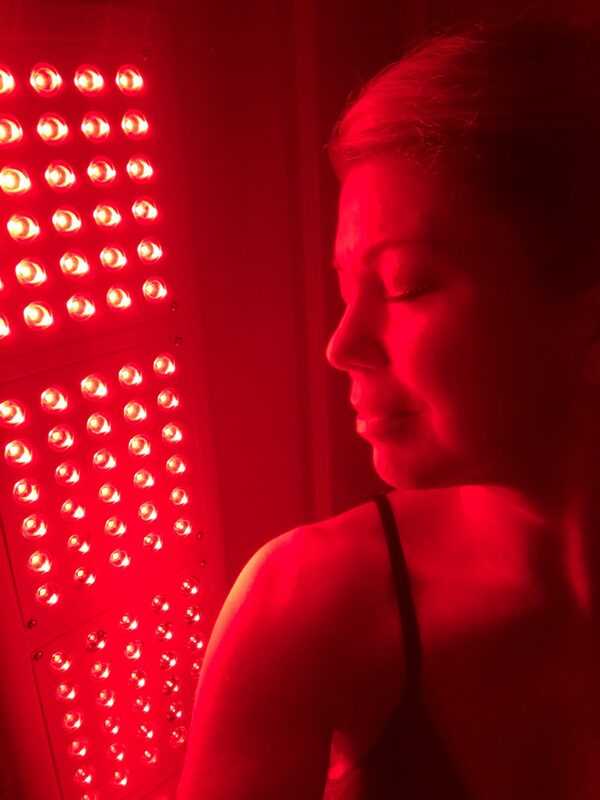 Red light therapy in a salon or spa can cost upwards of $75 per session for just the face! Even more for the full body beds. This can add up quickly, and is not convenient; this is exactly why I bought one for home use. Plus, I’m all about stepping up my anti-aging game! To give you a reference, I’m in my mid 40’s. By the time we reach age 30, our collagen production is reduced by almost 50%! Collagen loss is what causes wrinkles, sagging skin, loose jowels, crepey skin, you name it – collagen loss is what causes the skin to lose its youthful appearance. 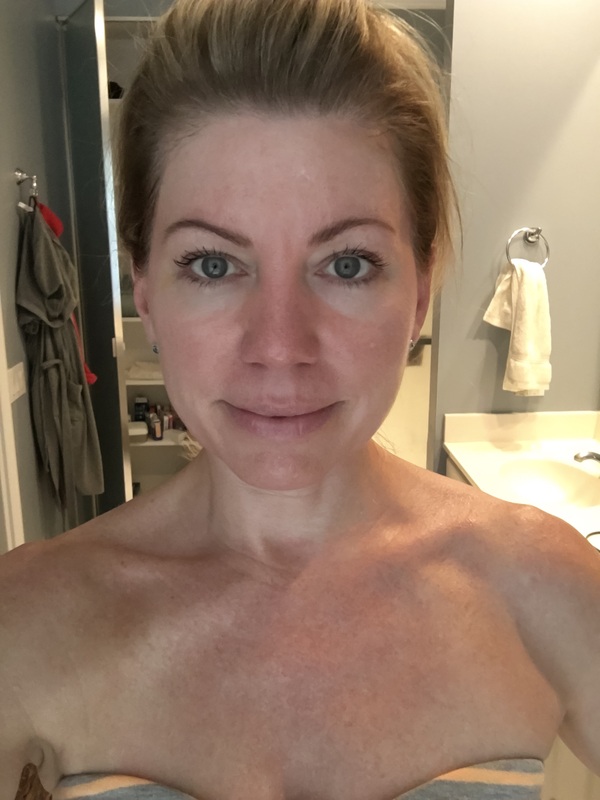 Anti-aging creams definitely help, but being able to supercharge your collagen production at the cellular level through Joovv Red Light Therapy is nothing short of amazing science and technology! Red light therapy is about the safest, most effective treatment you could do if you think about it – it’s like giving all your cells a needed energy boost! 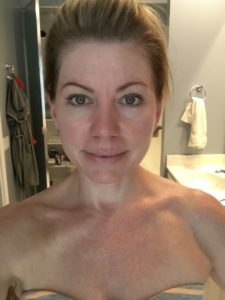 I’ve already noticed collagen loss and I’m not happy about it. Literally, in the past two years my chest and neck are showing signs of crepiness and the wrinkles on my chest are more noticeable, so this is why I wanted to get my hands on one. What are the Benefits of Joovv Red Light Therapy? The most impressive benefits seen with red light therapy are its anti-aging and anti-inflammatory benefits. 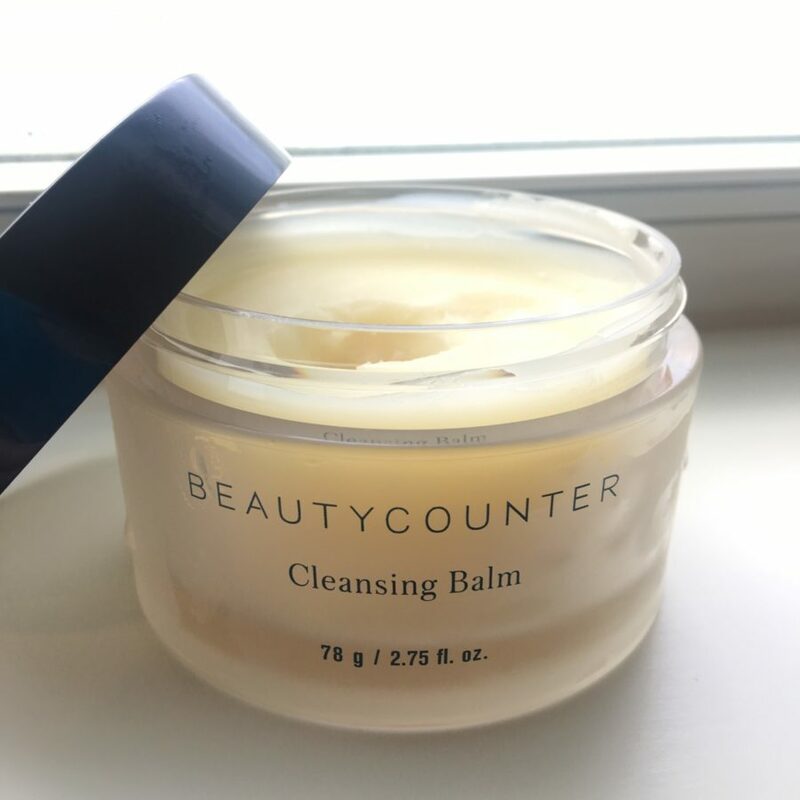 When collagen production increases and skin is rejuvenated, things like acne scars, stretch marks, wrinkles, fine lines, and sun damage begin to fade. And when cells are energized (mitochondrial and ATP production stimulated), healing takes place more quickly. 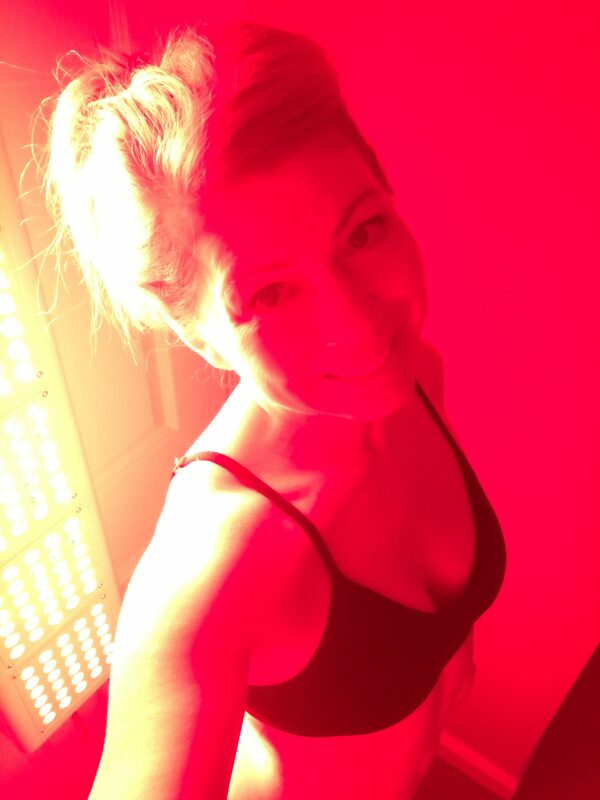 I was pretty excited about the full body effect of red light therapy! 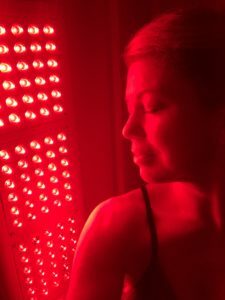 I’ve never thought to use a red light for things like reducing inflammation and speeding up the body’s recovery process, but now I know that it’s not just for skin rejuvenation. 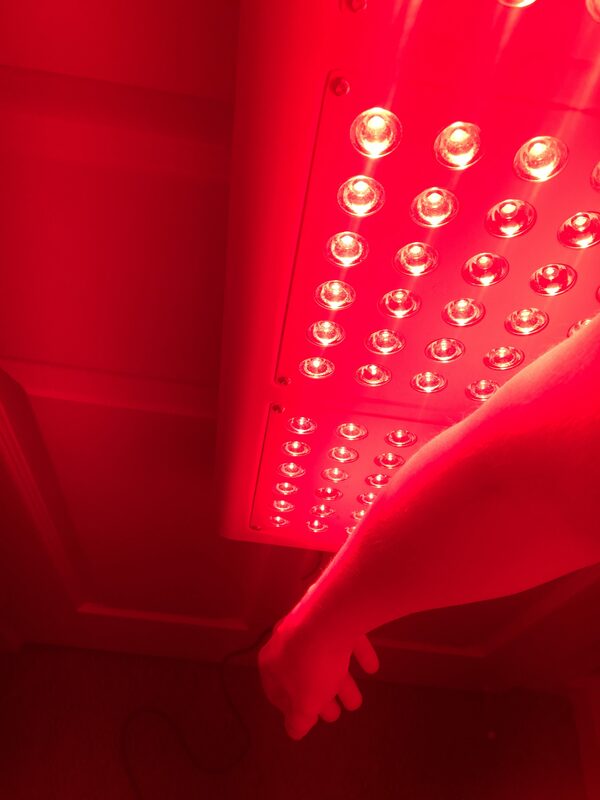 If you’re an athlete, or just in pain from health ailments, or go hard at the gym, red light therapy is a tool that can be used to relieve pain and inflammation from aching joints and help injuries heal more quickly at the cellular level. I work out a lot so I’m all about this. What’s the Frequency of the Joovv Red Light? And how does it work? The key for red light therapy is the right frequency, and the Joovv light is spot on! Red light in the mid-600 nm range and near infrared light in the mid-800 nm range is the sweet spot for red light therapy. Why is the frequency important? Well, sunlight can be broken down into different colors, kind of like the nutrients in our food are broken down and used for different purposes. And just like different nutrients in food benefit our health in different ways, each color of light in the spectrum has it’s own very specific effect on our bodies. Now for the good stuff! I followed Joovv’s guidelines for skin related issues so this is what my routine has looked like. I usually enjoy the red light fresh out of the shower before applying makeup. If you want, you can apply your creams (the light penetrates). It’s that easy… it actually feels really nice! I can see how red light therapy would help with seasonal depression disorder (SAD). It’s like getting a little dose of a warm day when you need it most. 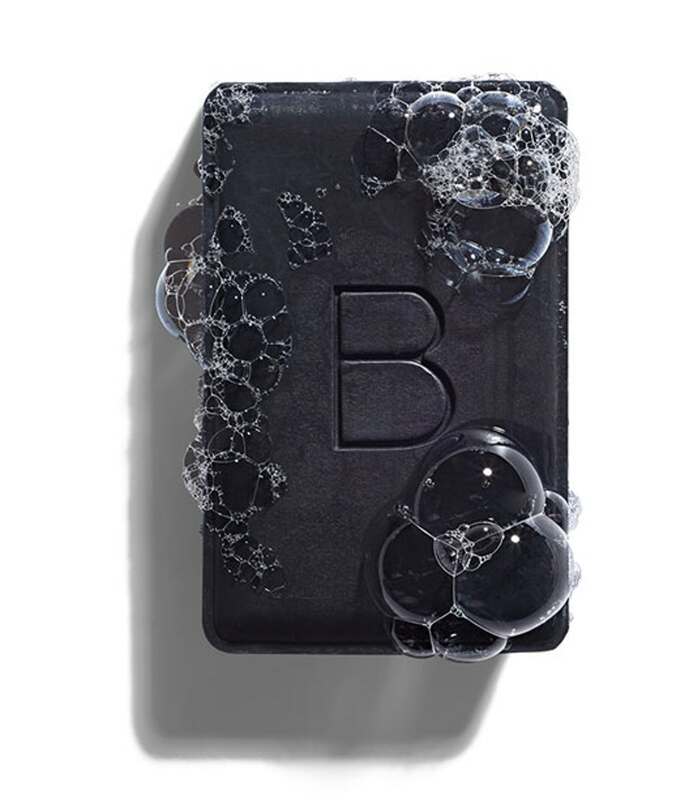 After my sessions, my skin is slightly flushed – and that’s the increased blood flow, I love it! It’s not quite like a fresh from the gym glow where you may be quite pink, it’s more subtle glow but a glow nonetheless! What I’ve noticed is that my face, neck and chest have all shown an improvement in radiance and plumpness. The skin on my neck and chest is not as crepey and my chest wrinkles have slightly decreased. I’m feeling more confident in wearing low cut shirts or dresses on date night with my hubby! I have gotten a ton of compliments on my skin lately, and the only thing different that I’ve been doing is using my Joovv light, so I’m really happy with my results so far and I’m excited to continue using it! So, I play beach volleyball and my shoulder has been giving me a lot of pain lately, and it’s been hurting when I wake up from sleeping on it. I also have tendinitis from overuse from swinging at the ball – both in my right arm. What I’ve been doing is doing some targeted treatment on my shoulder and arm with the light. 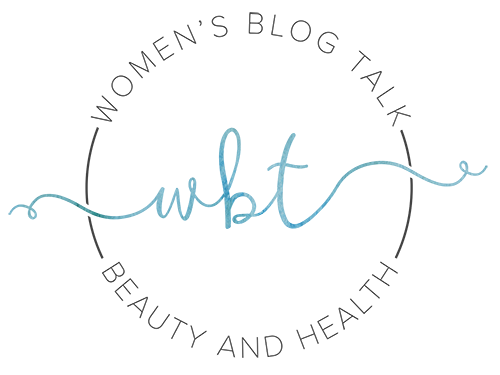 For treatment of pain, Joovv recommends you stand even closer to the light, 3-6″ away from it, for 8 minutes per day, 5+ times per week. I haven’t done it that frequently since I’ve been more focused on my skin issues, but I’ve just started alternating to give my arm some relief as well and it’s helping! First and foremost, the slight warmth of the light penetrating just feels good! And based on the research, the energy of the light therapy should help the muscle tissues and cells repair themselves. UPDATE: After about a month of using the Joovv light, my shoulder pain was completely gone. I never did get an MRI so I don’t know if it was a tear or a pull, but I do know that my shoulder feels great now and I can swing away with no pain. Tendonitis inflammation is down and it bothers me much less. I’ll post some links here to some good research – they can explain it better scientifically than I can! Is the Joovv Red Light Therapy Safe to Use Every Day? Yes! There’s no harm at all in using it more frequently, even up to twice a day for those problem areas. Joovv encourages people to try and fit it into their daily routines even if it’s only 4-5 minutes per day. Across hundreds of published clinical studies, there are no known side effects to red light therapy. The Joovv red light wasn’t cheap, $795 to be exact, however I feel like it’s going to be a very worthy long-term investment into my anti-aging routine, and help me with inflammation and injuries from volleyball. If you’ve been paying a spa or salon $50-$125 per treatment and going frequently, this will add up to much more over time, and you don’t have the convenience of doing your treatments at home, or your full body. I don’t know about you guys, but hair, nails, and most recently waxing, are the only appointments I want to waste my precious time doing. I LOVE being able to do red light therapy at home, and the Joovv makes a high quality light you can treat your whole body with! If you’ve been researching red light therapy at home, I highly recommend the Joovv light. It’s a quality light, and built to last, and has shown me results during my 8 weeks of use. The Joovv LED lights have a lifespan of 50,000 hours! I doubt I will ever need to change a bulb! Joovv offers a no-hassle, 60 day return policy, but my light is now a permanent fixture in my home! For more information, including research, press reviews, blog or to purchase the Joovv light, visit their official website below. Have questions about my Joovv light experience? Leave them below! So, which wavelength configuration should I get? The answer really depends on your health goals. 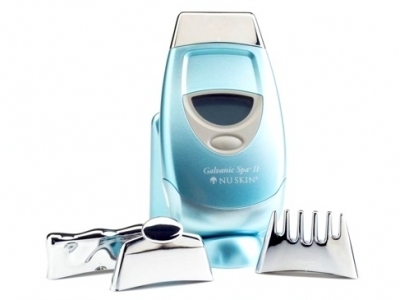 If you are strictly looking for skin health benefits such as collagen production, reduced fine lines, and better overall tone and texture, a 660 nm Joovv Light would work very well. If, on the other hand, you are only seeking deep tissue treatment - including muscles, joints, and organs - then the 850 nm wavelength configuration would be best. The third, and our most popular option by far, is the combination configuration of both red and near infrared light. This configuration provides a lot of versatility in terms of both superficial and deep penetration of light energy. It’s optimal for overall health and essentially provides the best of both worlds – helping you look good AND feel great! The Joovv Go battery is good for about 500 charges. That is about two years of daily use. What is the cost to replace it? 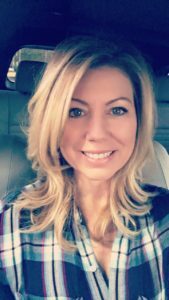 Do you still use red light therapy since your review in 2017? Would I need the basic not the combo if I want to also have the option of treating my thyroid and raising testosterone. Will it raise test. in women over 55? Will this be more effective for lifting my face than titan? Is there a reason you choose to wear googles even though red light therapy is supposed to be good for vision? What JOOVV did you get- Red light or combo?